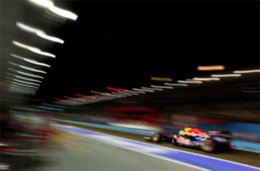 Singapore, 24 September 2011 – Sebastian Vettel emerged from a thrilling qualifying session on Saturday night with his and his Red Bull Racing team’s first pole position at the Marina Bay Street Circuit – and the team’s 100% pole-winning record in 2011 intact. The 24-year-old German’s 11th pole of the season, and the 26th of his Formula One career, gives him an ideal launching-pad for the race that may make him World Champion for the second time. Making it an all-Red Bull front row for the sixth time this season was Mark Webber, who responded to Vettel’s challenge with a brilliant final lap of his own that clearly meant a great deal to the Australian at a circuit he has never fully mastered. On a grid where each of the five front rows is occupied by a single team, Jenson Button edged out his McLaren Mercedes team-mate Lewis Hamilton to claim third spot but voiced concerns over his lack of running on a full fuel load after a disrupted opening practice day. Hamilton recovered from a Q2 puncture and was in the top two early in the final session but a refuelling problem stopped the 2009 Singapore winner from making a final run. Behind the McLarens come both Ferraris, with Fernando Alonso just 0.063 of a second slower than Hamilton but almost a second faster than Felipe Massa in the sister car. In a curious 10-minute final segment Mercedes-Benz left it late to send out first Nico Rosberg, then Michael Schumacher, the younger German beating his illustrious compatriot by just over two-tenths of a second, while Force India, content with getting both cars through to Q3, opted not to send either Adrian Sutil or Paul di Resta out again. The evening’s only casualty was Kamui Kobayashi, whose Sauber Ferrari brought out the red flag early in Q2 when it was briefly airborne through the ‘Singapore Sling’ at Turn 10. The car slithered into the barrier on the right-hand side with no injury to the driver but terminal damage to his chances of reaching Q3. After a brief interruption the Japanese driver’s team-mate Sergio Perez almost made up for Kobayashi’s mishap when he momentarily had the second Sauber in the top 10, only for fellow-rookie Di Resta to demote him in the final seconds. Neither of the Lotus Renaults made it into the top 10, with Vitaly Petrov again caught out on a circuit he has struggled with in the past. His own team-mate Bruno Senna relegated the Russian at the finish of Q1 but the Brazilian in turn could do no better than 15th in Q2. Vettel is within striking distance of Nigel Mansell’s all-time one-season record of 14 poles, set with Williams-Renault in 1992, but refused to let that distract him from his main target. Before the tense qualifying hour began, about 40,000 fans flocked to the Padang for a power-packed concert by Grammy Award-winning Colombian superstar Shakira, and after the race, partied the night away with ‘Mr Boombastic’ Shaggy himself. Marina Bay fans earlier had two incident-packed support races to enjoy. Afik Ikhwan Yazid used his pole position perfectly to win the first JK Racing Asia Series encounter for Meritus, the 20-year-old Malaysian claiming his fifth victory of the year. But the star of the 10-lap race was championship leader Lucas Auer. The 17-year-old Austrian – nephew of former F1 great Gerhard Berger – started from a lowly ninth on the grid but set the race's fastest lap of 2:22.630 as he forced his way through to finish second for Eurointernational. Auer was earlier involved in a dramatic-looking accident with Aaron Chang's Eurasia Motorsport entry from which the 17-year-old Chang emerged shaken but without serious injury. The day's second race saw two-time Porsche Carrera Cup Asia champion Christian Menzel hold off a late charge from Singapore specialist Craig Baird to win the first of two PCCA races this weekend. Menzel's Team StarChase entry started from pole after the German driver recorded the fastest Porsche lap ever recorded at Marina Bay, a stunning 2:20.904. Menzel, a guest driver this weekend, kept his nerve after a Safety Car period prompted by Wayne Shen's accident at Turn 14 to win the 12-lap race by seven-tenths of a second from last year's double Singapore winner Baird in the SC Global Racing entry. Third was LKM Racing's Keita Sawa while Jeffrey Lee was the first Class B finisher in the Pauian Archiland Absolute Racing car.